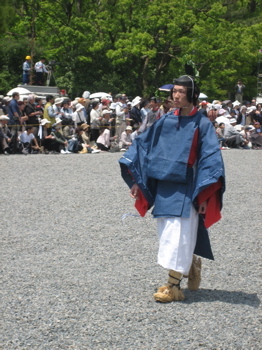 The Aoi Matsuri is held on May 17th. It is one of Japan's largest and most ancient. 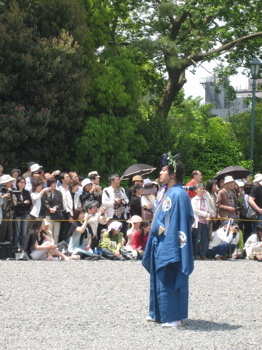 600 people dress in imperial court costumes of the Heian Period (794-1185) and parade through the streets from the Imperial Palace and up and around to Kamigamo Shrine. Following Kyoto's founding in 794, the first emperor of Kyoto, Kammu, personally visited both shrines and recognized their deities as protectors of Kyoto. 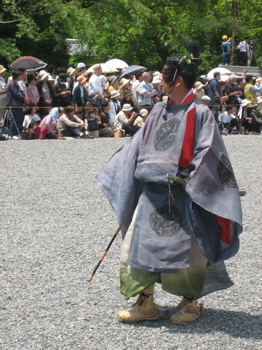 In 807, he officially established the Aoi Matsuri as an annual, imperial event. Soon it was referred to as simply the 'Festival'. 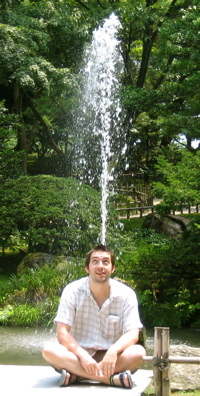 It reached its most spectacular in the middle of the Heian period, during the reign of the Fujiwara regents. Today's festival is, for the most part, a tribute to that time. The festival was not held from the start of the Onin Wars (Japan's civil war of the late 15th century) until the end of the 17th century. 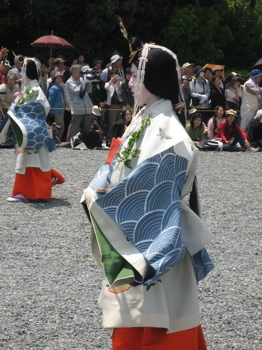 Soon after the 'Warring States Period', the festival was revived and is considered one of the most important in Japan. 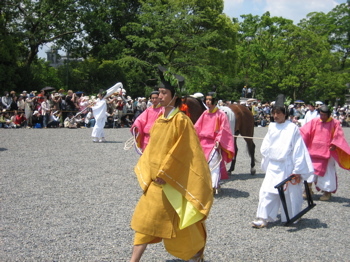 The festival procession is made up of two parts: the imperial messenger's retinue and the Saio-dai (a young imperial princess, who in the Heian period was the head of both shrines, a system which existed between 810 and 1200). 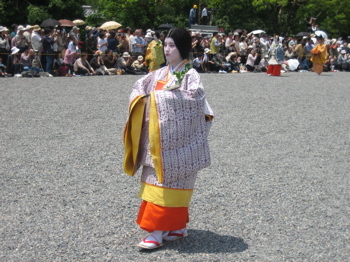 Today, a young Kyoto woman is chosen to play the role of the Saio for the period of the festival. 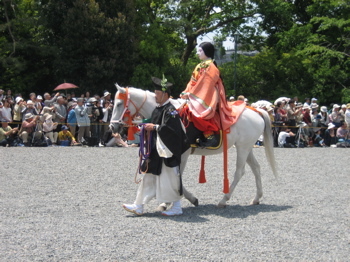 She is the focus of the parade, riding on a palanquin dressed in imperial Heian robes (12 layers in all). The parade is a colorful array of imperially dressed citizens, about 600 in all, who form the public part of the proceedings. 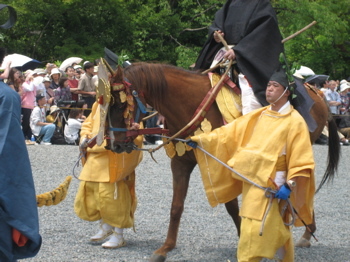 Though the main focus of the festival has become the procession on the 15th, the festival really begins on the 3rd of the month with an archery display performed on horseback at Shimogamo Shrine. The archery is more than just a display of skill, it is also a purification ritual for the procession route later in the month. 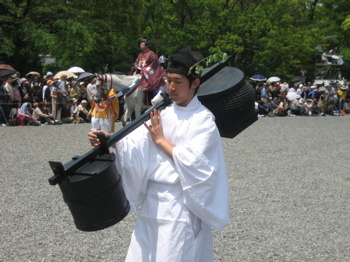 Also on the 3rd, the Saio is purified in a ceremony at Kamigamo Shrine. 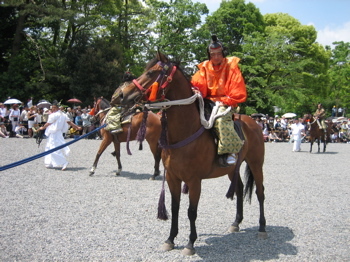 Then on the 5th, there is a horse race held at Kamigamo Shrine between two teams dressed in Heian costumes. 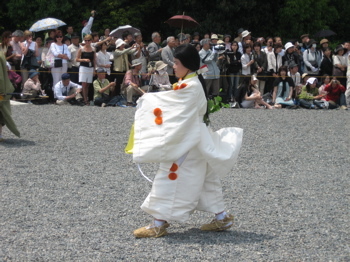 Three days before the official procession, on the 12th, the Mikage Matsuri is held. 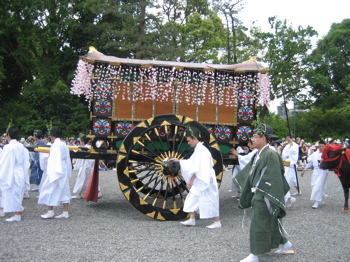 Departing in the morning from Shimogamo Shrine, the official festival priests proceed to Mikage Shrine, where they 'pick up' the gods and carry them on to Shimogamo Shrine. 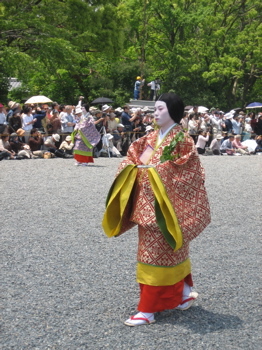 Upon returning to Shimogamo Shrine, a traditional dance and music performance is given. 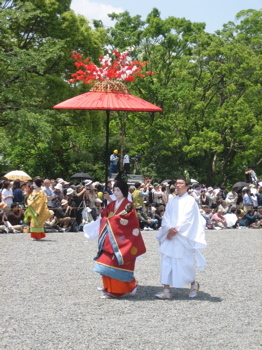 Then finally, on the 15th, the grand procession proceeds from the Imperial Palace and up and around to Kamigamo Shrine. *The Aoi Matsuri is considered to be one of the oldest festivals in the world. Its origin can be traced back to the sixth century when a series of severe storms destroyed the important autumn harvests. A diviner determined that the deities of Kamigamo and Shimogamo Shrines were angry at the disrespect of the people. To quiet the gods, Emperor Kinmei (540-571) had special rites performed at Shimogamo and Kamigamo Shrines, Kyoto's two oldest shrines. Magically, the storms came to an end, and from that time on, imperial officials have paid regular visits to the two shrines. The name of the festival comes from the fact that the dark and shiny spiked leaves of the aoi (hollyhock) bush are used in decorating the costumes. At one time, these leaves were believed to have all sorts of powers including protection against lightning and earthquakes and guaranteeing easy childbirth. **Thanks to the 'Kyoto Visitor Guide' (AD BRAIN INC.) for providing much of the detailed information about the Aoi Matsuri. The blog have pleasant information, i got smart thoughts from this astounding blog. i am continually searching like this sort blog post. i trust i will see once more. go to this "best essay writing service":http://www.clazwork.com/index.php for getting writing kind of assistant and even you can get the guidelines too. Mystically, the tempests arrived at an end, and from that time on, royal authorities have paid consistent visits to the two places of worship. 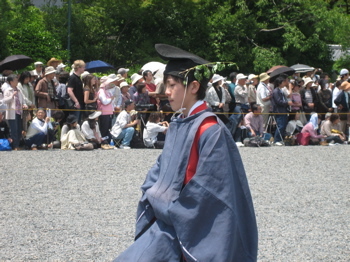 The name of the celebration originates from the way that the dim and sparkly spiked leaves of the aoi (hollyhock) shrub are utilized as a part of enhancing the outfits.